Can’t wait to see what the great folks at Peppermint Creek have created with the wonderful veterans and military family members of Lansing! Our first production in Michigan, “Telling: Lansing” will undoubtedly not be our last. We’ve loved working with these people, and can’t wait to see the show! Showtimes, info and tickets HERE. Break a leg!!! Working again with the great folks at Mississippi Humanities Council, along with John Warrick and the University of Southern Mississippi, “Telling: South Mississippi,” will open in Hattiesburg on November 11th. For information and tickets, click HERE. With veterans from the WWII era to the present day, “Telling: South Mississippi,” promises to be a tremendous broad, engaging experience of American military history – as told by those who were there. 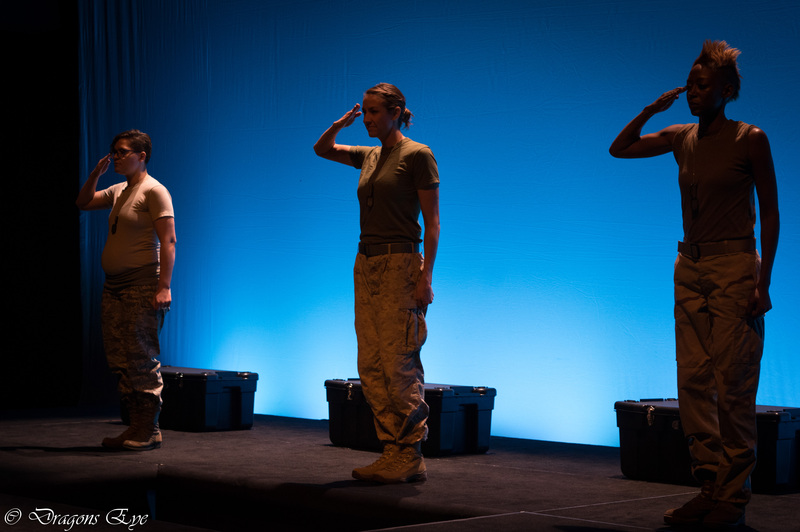 Our second production with Florida Humanities, “Telling: Pensacola,” also directed by the fantastic Lisa Powers is the continuation of our work in the state of Florida to bring the experiences of the men and women in uniform and their family members to their communities – live and in-person. We are so excited about our partnership with Florida Humanities, and even more excited to see this next group of fantastic military and military family members tell their stories. We’ll see you there! Telling: Kansas City opens in 2 weeks! The Telling Project, working side by side with the National World War I Museum and Memorial, Kansas City Public Television and underwritten by the Bob Woodruff Foundation is seeking military veterans and military family members who want to perform their stories of life and the military in “Telling: Kansas City,” to be performed in October, 2015 under the direction of Erin Merritt. This is an opportunity for you to speak directly and honestly to your community about your experiences – as a member of the military, as a veteran, as a military family member. Performances will be video-recorded and broadcast on Kansas City Public Television as part of their Veterans Day programming. To sign up or for more info, contact: info@thetellingproject.org. We look forward to working with you! We are proud to announce that we have received a second grant from the Bob Woodruff Foundation, to support and expand our ongoing programming, and launch our new initiative, The Telling Project Institute. In 2014, The Bob Woodruff Foundation made possible a tremendous leap forward for us, allowing us to double our programming. In 2015-16, we will see another significant growth in both the amount and kind of programming we will be able to offer – again, due to the Bob Woodruff Foundation. Join us in supporting our nation’s injured service members, veterans and their families by taking a #stand4heroes at bobwoodrufffoundation.org/stand4heroes. Pensacola veterans and military families – here we come!! Following on our wonderfully successful (and still ongoing) work with the Florida Humanities Council and WEDU in Tampa Bay, our next location in the Sunshine State will be Pensacola. With performances scheduled for November, 2015, we’re looking for veterans and military family members in the area who are interested in telling their stories of life and the military. Any era, any branch, any background – we want to hear what you have to say! To sign up, contact Lisa Powers – Lpowers @flahum.org, or call 917-822-8710. We look forward to working with you! Are you a Lansing, MI area veteran or military family member? Would you like to tell your story to your community? Working with the Peppermint Creek Theatre Company, The Telling Project is working to create “Telling: Lansing, MI.” “Telling: Lansing, MI,” will perform in November, 2015 at the Peppermint Creek Theatre, and will be your opportunity to speak directly and in-person to your community about your experiences in and with the military. For information or to sign up, please contact The Telling Project: info@thetellingproject.org. We look forward to working with you! Are you a female veteran in Palm Springs, CA? In a new and unique approach to our work, we are working in Palm Springs, CA to creat a performance that will specifically highlight the stories of female service members. Set to perform in November at the Indio Theater, “Telling: Palm Springs,” is actively seeking participants. If you or anyone you know lives in the area and might be interested in performing, please contact: info@thetellingproject.org for more information and sign-up. We look forward to working with you! Telling: Tampa Bay – first performance of 2015! With the Florida Humanities Council and PBS affiliate WEDU, “Telling: Tampa Bay,” will be the first ‘Telling’ performance of the year. Six Tampa area veterans and one military spouse will perform in venues throughout the Tampa Bay area over the next month, talking openly about their experiences in uniform and their transitions back to civilian life. Link HERE to locations, dates, showtimes and information about the project.